is the blue/purple variety of the mineral zoisite (a calcium aluminium hydroxyl Sorosilicate (Ca2Al3(SiO4)(Si2O7)O(OH)) + (Cr,Sr), with hardness of 6.5 – 7 on the Mohs scale) belonging to the epidote group. It was discovered in the Mererani Hills of Manyara Region in Northern Tanzania in 1967, near the city of Arusha and Mount Kilimanjaro. Tanzanite is used as a gemstone, and naturally-formed tanzanite is extremely rare, more rare than diamond in fact, still found only in the Mererani Hills. Tanzanite is pleochroic, which means that it shows different colours depending on the viewing angle. In order to get the preferred blue or violet-blue hue, gem cutters must properly orient tanzanite gemstones. The vivid blue of tanzanite can rival fine sapphire and makes tanzanite an extremely desirable gemstone. This attractive colour is so sought after that tanzanite is routinely heated to enhance fine blue and violet hues and minimize the less desirable brownish tones. Tanzanite is considered to be a valuable spiritual stone that can be used in order to relate to other realms or for meditation. Tanzanite is thought to inspire compassion and to encourage calmness. It is also believed to be helpful in facilitating communication and solving problems. Additionally, tanzanite has been added to the list of birthstones for those born in December by the American Gem Trade Association (AGTA). According to feng shui beliefs, blue tanzanite carries water energy whilst violet tanzanite carries fire energy. Since tanzanite exhibits perfect cleavage, tanzanite gemstones and jewellery should be protected from hard blows, which could cause damage. Therefore, tanzanite should be worn in protected settings, such as bezel settings, and not worn daily in pronged settings. Tanzanite gemstones and jewellery should not be subjected to extreme heat or sudden temperature changes. 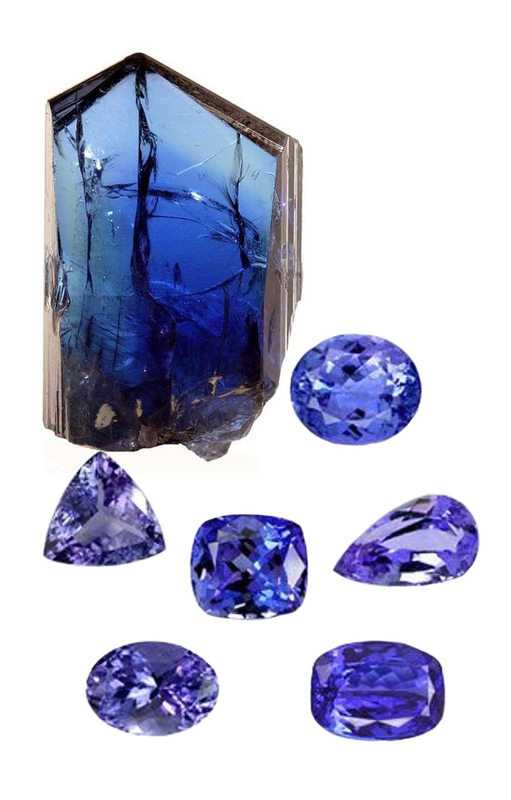 Additionally, tanzanite should not be exposed to acid. Avoid the use of ultrasonic and steam cleaners. The best way to clean tanzanite gemstones is by using soapy water and a soft cloth. Be sure to rinse well to remove soapy residue. Always remove any jewellery or gemstones before exercising, cleaning or engaging in vigorous physical activities such as sport. Store tanzanite gemstones away from other gemstones to avoid scratches. It is best to wrap gemstones in soft cloth or place them inside a fabric-lined jewellery box.